It is my ongoing effort to catalog all recipes that are cooked in my kitchen – from simplest of dishes to the indulgent ones, from the rustic to the chic, from dishes across cultures to the most traditional of dishes, including some heirloom recipes. Somehow this particular dessert, also called Roah di Kheer, managed to slip from my mind. 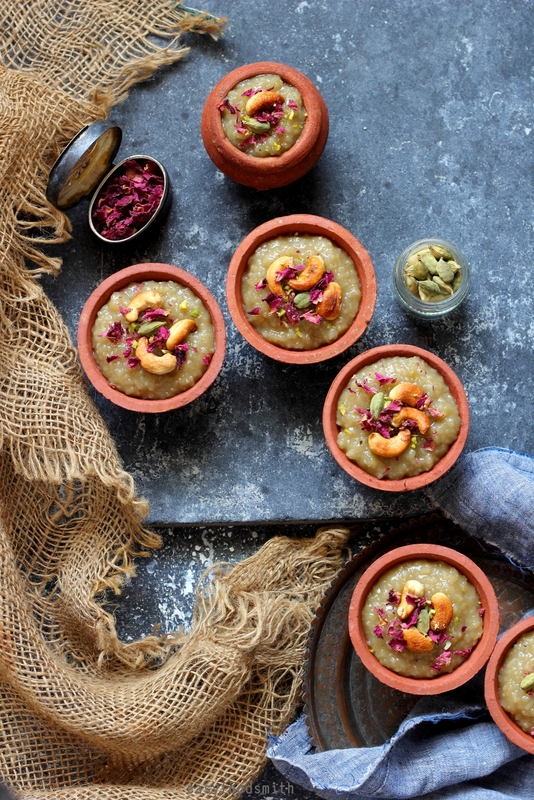 Few weeks ago my mother-in-law mentioned about this simple and traditional kheer that is made in Bihar and also in Punjab and suddenly my memory cells came into action and I was reminded of how my grandmother used to make this kheer (pudding) especially on Makar Sankranti / Lohri. She used to make it on a wood fired angeethi and served it lovingly straight from the pot. Pick, wash and soak the rice in sufficient water for half an hour. Heat the cane juice in a cooking pot and bring to a boil. After a few minutes there a scum like layer may appear on the top. Remove that using a spoon/ ladle or a small sieve. Drain water from the rice and add the rice to the boiling cane juice. Stir well and cook the rice on low heat, uncovered. 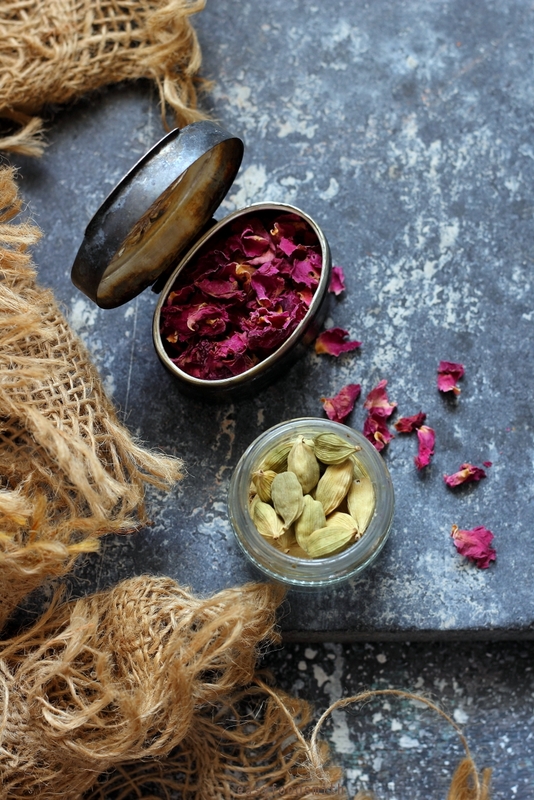 Switch off heat and stir in the cardamom powder. 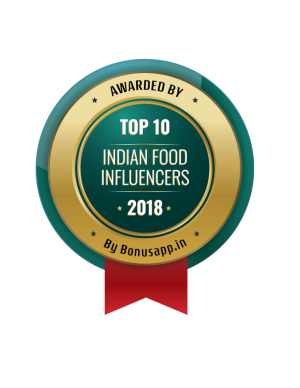 Note – I used the Gobind Bhog variety of rice which is a small grain rice that is very aromatic. You can go for tukda basmati chawal i.e. broken basmati rice. Note – Using milk for cleaning the juice is an optional step. If your cane sugar is clean and hygienic, you won’t need to do this step. 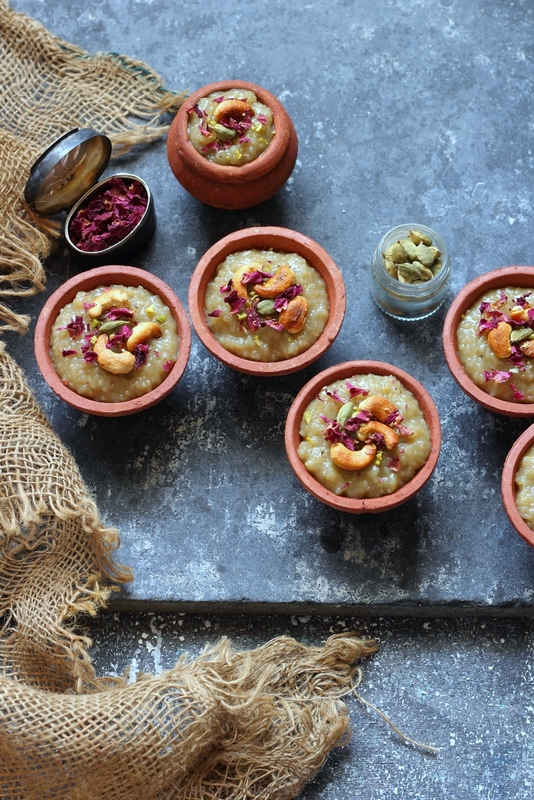 Note – It took approximately 25 to 30 minutes for the kheer to be ready. 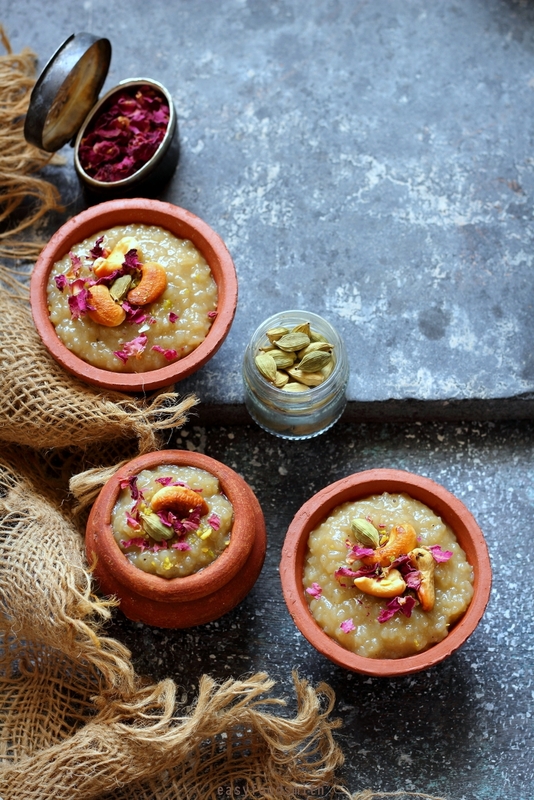 Note – You need to keep in mind that the kheer will thicken to some extent on cooling and in case you intend to serve it refrigerated, it further thicken, so adjust the consistency accordingly. 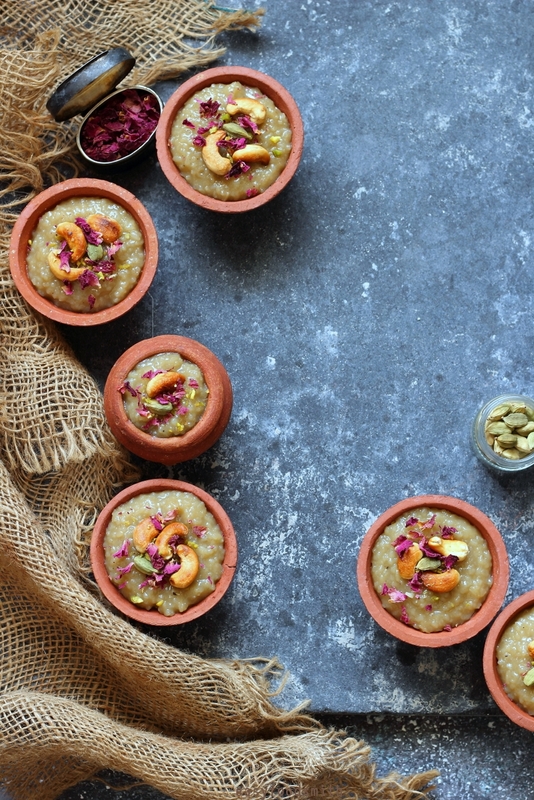 Note – This kheer is somewhat on the sweeter side (especially for a person like me who prefers less amount of sweetness in my desserts and bakes) and you may end up serving even eight people since a little will go a long way. But people who like their desserts rather sweet, will really enjoy this dessert. These rice and can treats look so beautiful and I bet they are very yummy as well. Love those terra cotta pots..so cute! Never had these, but gosh, these look wonderful! Fun dish — thanks. This rice pudding looks so good, creamy…I love the hint of cardamon…thanks for the recipe Taruna. I hope you are enjoying your week! Wonderful pictures showing a delicious dish. I love it! Sounds delicious and beautiful presentation! This is a new one for me. I have some delicious rice puddings but never one with cane juice. A friend gave me a jar of pure cane syrup for the holidays and now I want to open it and give this a try. The addition of cardamon, which I love, sounds interesting. Thanks for sharing! I saw it on Instagram but then forgot to check your post. I remember my mom used to make this, when we were kids. Thanks for sharing, that brings back so many sweet memories of my childhood.